Let's face it, hiring the right agency to work with your company can be hard. Everyone has heard horror stories of hiring the wrong agency and having them do long term damage to your site. I will be the first to say you need to be very careful when choosing a company to work with. The reason it's hard to hire a search engine optimization company comes down to how technical the process is. In most cases the problems arise because the business owner isn't able to judge the quality of the work the company is performing. To keep your company safe, you must ask these 5 questions before you hire an SEO Agency. 1.What Techniques will you use to improve my search engine rankings? 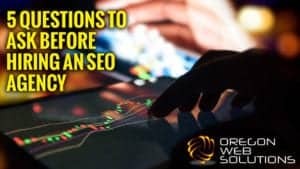 Every search engine optimization agency will use different techniques to improve your SERP rankings. Agencies will be very accustomed to being asked this question. For the most part, the way an agency improves Google rankings will depend on obvious factors such as on-site optimization, social media marketing, and website engagement. Other factors will also be utilized including off-site techniques like back links and website outreach. Most agencies will have both public and private SEO tactics and this should be expected. In fact, the most effective techniques will be closely guarded and are considered “trade secrets” in the industry, so you shouldn’t expect full disclosure here. 2. Do you adhere to Google’s search engine webmaster guidelines? It’s important when choosing an agency that you find one that will adhere to Google’s Webmaster Guidelines. This is a set of rules that Google has developed to explain what they consider good and bad SEO tactics. Another word for these types of techniques are called “white hat” and “black hat.” It’s important to find a company that will there to Google’s Webmaster Guidelines and only use safe and effective “white hat” search engine marketing tactics. 3. How do you measure success of the SEO campaign? Success can me measured a number of ways and can differ from client to client. One of the easiest ways to measure success is through improved Google search rankings. Using rank tracking software such as Pro Rank Tracker, you can monitor the effectiveness of your marketing campaign. Remember, organic search rankings improve slowly over time, so it’s important to have a long term view when measuring your progress. 4. Do you have any #1 Google Rankings you can show me? This is an important question to ask because any company that doesn’t have #1 Google Rankings for themselves will have a hard time effectively improving yours. In fact, this is so important i'd highly advise never hiring any company who can't show examples of where they have successful implemented their own techniques. The bottom line is anyone can sound knowledgeable when explaining the technical aspects of search engine marketing. The difficult part is knowing the techniques and tactics that are currently working, and successfully implementing those for your agency and your clients. That's why we recommend to ask for at least 3 examples of #1 Google rankings before you consider hiring the agency. 5. What happens when we part ways and I’m no longer a client of yours? Inevitably, you will end up parting ways with the agency. The nature of SEO is it's usually a 6-12 month process and will eventually be finished. It's true that you could technically do SEM indefinitely on your site, but in most cases a 6-12 month term will be long enough to get the results you desire. So what happens when you part ways? Good companies will assure you that the link building and outreach that has been performed on your site will be left in tact. Furthermore, they should offer you a spreadsheet with login and password information of all assets they have created for your business. It's absolutely crucial that you get a verbal or written agreement prior to signing with a company that all online marketing efforts will stay in place after the business relationship has ended. If you want to learn more about how search engine marketing and claim your free website analysis, just simply click on the Discover Form link to get started! 5 Questions to Ask Before Hiring an SEO Agency in 2018	Overall rating:	5	out of 5 based on 48	reviews.